The email notification is only available for Premium users. By default, you can use MailChimp to send an email notification for every sign-up. However, there are some drawbacks to this method. When using double opt-in, the notification email will only be sent if the person confirmed their email address. When not using double opt-in, the email will not be sent at all. MailChimp treats sign-ups with double opt-in disabled as "imports". We're in luck though. 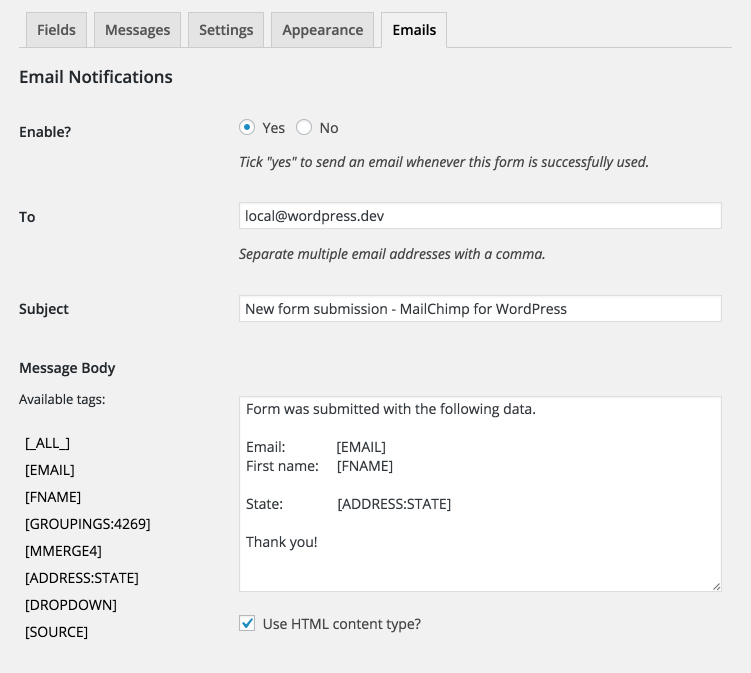 You can use MailChimp for WordPress Premium to send out an email notification for every successful form submission. After activating the Premium plugin, your "edit form" page will have an additional tab called "Email". Clicking this tab will present you with the following screen. On this screen, you can configure the email notification that is sent out right after someone submits the form. You can specify multiple email addresses by separating them with a comma. The available email tags can be used in all the fields, so you can even send a copy of the submitted data to the person that filled out the form.